The Fireman's Friend is an internally mounted check-type fill valve, capable of flowing at a rate in excess of 1,000 gallons per minute. The valve is designed to be self deflecting, requiring no additional diffusion device. This design only requires the 4" valve body to have less than 3 lbs. to open while the 2 1/2" valve requires less than 6 PSI. The Fireman's Friend is constructed of stainless steel, and is a spring actuated piston-type sealing mechanism designed to minimize seal wear and provide positive sealing of valve after shutting off the feed source. The Firetech HiViz Brow Light is a low profile bar-style LED light designed to mount on the front of the chassis. The brow light provides 30,000 Lumens of lighting when fully activated providing optimum visibility when on the scene or driving. The brow light can provide firefighters with three modes of switching depending on how large the area and distance being illuminated are. 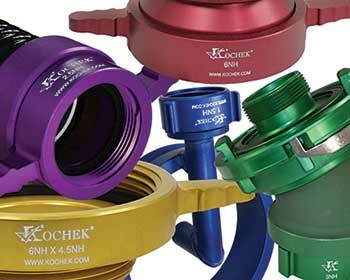 Power coated adapters allow fire departments to use a colour to illustrate each adapter's function (intake/discharge) or match the adapter to the discharge bezel. The only problem was the chemicals put on the road caused the paint to flake off. The New Quantom Coating is available in several colours and designed to withstand heavy use and exposure to harsh weather conditions. The latest in Hard Coat technology offers superior durability and resistance to corrosion and abrasion. The Screaming Eagle Siren provides over 123db of warning noise output with a maximum continuous amperage draw of Its focused cone design sends penetrating sound waves for- ward into the vehicles in front of you, allowing other drivers on the road to "feel" the siren noises as well as hear them, The new design provides all of these features with a 6” diameter rotor and a total weight of 24 lbs. The "Screaming Eagle" Siren has been designed with a fully balanced rotor, dual bearings, hard anodized stator, two brakes that allow the siren to “wind down” in 8-10 seconds, heavy duty electrical components, and chrome finishes for durability in all climates and environments. The combination of versatile mounting options, low amp draw and its light weight design makes the Screaming Eagle the ideal siren choice for all types of vehicles.